It is in the nature of critics to quibble. Not because we like doing so, but because we are in the business of weighing a work, and in a good book problems can stand out more starkly than they do in mediocre novels. 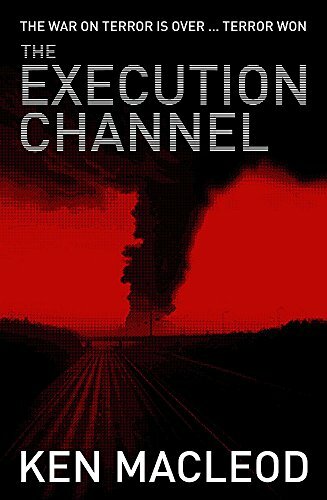 The Execution Channel is a good book. In fact it is a very good book, perhaps the best Ken MacLeod has written to date. Which makes the couple of places where it goes wrong all the more infuriating. I'll come to those quibbles later. Let me start with something that cannot be laid at MacLeod's door. The book is emblazoned with the line: "The war on terror is over. Terror won!" It's a good line, very immediate, and most of the comments I have seen about this book take that idea as their starting point. Unfortunately it is completely wrong. A novel that explored the aftermath of the war on terror, one in which the terrorists are victorious, would be a very interesting novel, but it wouldn't be The Execution Channel . For a start, the war isn't over; this is a novel that starts with an apparent nuclear explosion at an American airbase in Scotland, it goes on by way of an oil refinery explosion outside Glasgow, the blowing up of Spaghetti Junction in Birmingham, and the flying of an airliner into Newcastle airport. This is a war that is escalating, and a novel about the cost of that escalation on the British social structure. And that is something MacLeod does brilliantly: the constant corner-of-the-eye glimpses of burning corner shops, of mobs, of haggard Moslem women peering out from army buses build up into a vivid picture of a nation fracturing with doubts and suspicions and fears. Second, it is very difficult to say the terrorists won when you have no idea who the terrorists are. They do not appear in this novel. Everyone that we see taking part in this deadly game, on whichever side, is a representative of the state. One of the most frustrating things about the knee-jerk Bush-Blair reaction to 9/11 was the unquestioned assumption that there is no substantive difference between a war on terror and a territorial war. The invasion of a sovereign state is not the same as an attack upon a diffuse terrorist network, and confusing the two is not a mistake I would have expected of MacLeod. Yet every act of terrorism in the novel is traced back to a state sponsor. This is not so much a war on terrorism as another version of the old Great Game involving Britain, the U.S., France, Russia, China, Korea, and a handful of old Soviet republics. In other words, this is really an updating of the Cold War thriller (and it owes a lot to early Le Carré also in the language and tradecraft used by the characters, though it is amusing to see Smiley's dead-letter box updated into an unused website). This is not, by the way, a quibble about the book; I am merely pointing out that the blurb does not describe the novel MacLeod wrote. The novel MacLeod wrote is, essentially, a thriller with elements of the traditional British catastrophe novel running in the background. Roisin Travis is one of a handful of protestors in a peace camp outside the U.S. base at RAF Leuchars. Alerted by a comment on the blog of her brother, serving in the army in Kazakhstan, she chances to photograph a strange device being unloaded from a transport plane. When the device explodes not long after, in what at first appears to be a nuclear attack, she realises she has evidence of something far bigger than she anticipated and goes on the run from British and American agents. Meanwhile her father, James Travis, is also on the run. A computer expert who has worked on a lot of government contracts, he has also been, for several years, an agent of the French against the British. But now his cover has been blown. Back to the chase, which is what constitutes most of the rest of the novel. James proves to be an unexpected master of tradecraft as he effortlessly evades his pursuers, even when he breaks his journey to rescue a Moslem corner-shop owner and his family from a baying mob. (A number of times, MacLeod uses such broad-brush methods to show who are the good guys and who are the bad guys; we know the American agent leading the chase is a baddie when he is responsible for torturing to death Roisin's brother.) Roisin herself is not so fortunate; she is captured, interrogated, then released, though she knows that this is just so she will lead her captors to James. What follows is a cat-and-mouse game as the two try to see through the partial information they possess to understand the fuller picture. But espionage is less about information than it is about disinformation, and deception lies at the heart of this novel. This is not just in the way that James and Roisin are constantly changing their appearance, or indeed the way that James regularly uses his computer skills to create new identities. We see the team of English, Scottish, and American agents chasing Roisin deceiving each other. We see the team of freelancers whose job it is to feed disinformation into the web. We see the differing ways that events are reported in the press. We see the American teenager who runs a top conspiracy website, and who slowly begins to see through the disinformation he is being fed. Yet even when anyone in this novel glimpses the truth it is only ever a glimpse, only ever partial. We live in a world, MacLeod tells us very convincingly, in which it is now impossible to know the whole truth, and in which partial truths are as deadly as outright lies. It is a stunning evocation of the future, painstakingly extrapolated from our present, and painting the social, moral, and human consequences in startling detail. But it is not our future, which brings me to the first of my major quibbles with the novel. There are several places in the novel where the novelist himself is too apparent. I've already mentioned a couple of minor instances: the broad-brush illustrations of good guys and bad guys, the in-jokey descriptions of old-time Scottish lefties. There is also the all-too-convenient deus ex machina moment when the execution channel takes over the hotel television just as Roisin and the MI5 agent Maxine meet, and shows the death of Alec Travis. But the moment that really irked me was when this stopped being our future. This comes in a rant by conspiracy theorist Mark Dark which lets slip that in this history Al Gore won the disputed 2000 presidential election. The rant allows MacLeod to editorialise on the course of history: the 9/11 atrocities turn out to be not nearly as atrocious as those we witnessed, but bad enough still to set in motion a train of events leading to a situation analogous to where we are today. MacLeod may be right, Gore would not necessarily have been any better than Bush in the circumstances, but in making the point MacLeod defuses his whole novel. What we have here is a very powerful political novel, a vivid and potent commentary upon the nature of the world taking shape around us today. But the point is blunted if it is possible to point to the alternate history and say our world is already different from the one portrayed, hence the critique is irrelevant. I don't personally believe that the critique is irrelevant, but it would undoubtedly have been stronger if the novel had been set unequivocally in our world. It is especially galling that after this rant the alternate history notion plays no substantive part in the rest of the book. My other major quibble with the novel is with the ending. Something extraordinary and very science fictional happens; it has been fairly signalled throughout the novel but still comes as a very effective surprise. It necessarily happens off stage, and it is dealt with rather too quickly and neatly to be entirely satisfactory as a climax to the book, particularly as a climax to this novel. But what was really irksome was the brief epilogue which provided a bland happy ever after for our main characters. This was so at odds with the tone, character, and intent of everything that has gone before that it doesn't seem to belong in the same book. Gritty reality, time spent trying to make our way through this savage political milieu, does not dissolve so easily into fairy tale. 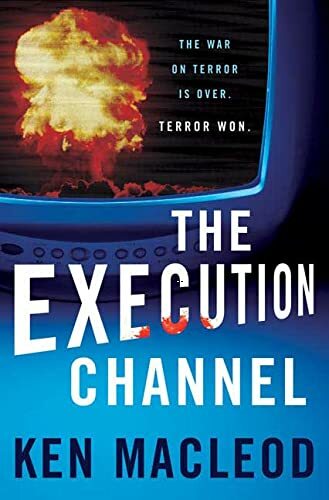 The Execution Channel is an extraordinary novel, one in which Ken MacLeod has exercised his remarkable political mind more effectively than in anything else he has written to date; but it is one in which Ken MacLeod the writer has taken the occasional misstep. One wonders how powerful a novel this might have been if the political and the literary had been in lockstep. Paul Kincaid has received the SFRA's Thomas D. Clareson Award for Distinguished Service for 2006. He is the coeditor of The Arthur C. Clarke Award: A Critical Anthology . Second, it is very difficult to say the terrorists won when you have no idea who the terrorists are. They do not appear in this novel. Those who are perpetrating acts of terror (default terrorists in our current political vocabulary) do not appear in the novel. Those who are responsible for acts of terror, do. I appreciate the cynical point that our governments are responsible for terrorism; but my quibble is that this too easily turns the war on terror into exactly the sort of territorial war that has been the biggest blunder, the biggest act of political ineptitude, of the Bush administration. My reading of it is that Ken's writing about a future (or alternative present) in which the "War on Terror" is maintained by state-executed acts of terrorism, attributed to the faceless enemy, precisely to keep the west on a war footing. The west isn't simply responsible for terrorism, but actually carries it out. I’m not sure the cold war thriller genre needs updating at a time when yesterday’s Guardian led with Putin’s threat to target European cities. In this respect, MacLeod consistently provides more useful analysis than mainstream political commentators because of his understanding that the main currents of the 20C are still active. People seem to be following his lead: in April, a Ministry of Defence report on the ‘future strategic context’ discussed the middle classes turning Marxist, electromagnetic pulse weapons and ‘terrorist’ flash mobs – quicker just to read the Fall Revolution sequence and subsequent output. The three points Paul Kincaid raises do indeed stand out against the rest of The Execution Channel but one could argue that that is exactly why it is more than a good thriller. The alternative history aspect seems partly designed so that the book is not taken as another example of dodgy conspiracy theories but also, more importantly, so that the blame for the current world mess is not simply blamed on the Bush Administration but seen as a result of general western trends. A Gore administration would probably not have behaved significantly differently. The book reminded me of Perry Anderson’s New Left Review (Mar-April 2001) editorial on the 2000 US elections which virtually expressed relief that Gore had lost – maybe we live down the better fork in history! The sf twist at the end is worth it for the fun factor. At one level, it suggests socialism still has more to offer than the bankrupt West but also it makes a serious point about the only way that the vicious struggle for resources on this planet is ever going to be transcended. The ‘what happened next’ ending works better than a rounded denouement because it directs us away from looking at easy conclusions and turns our attention out to the understandings and possibilities displayed in the margins of the story. As MacLeod has suggested in interviews, the characters make discoveries along the way – at the roadside as it were – that are more important than the conclusion of the plot. In this respect, the book has similarities with Richard Morgan’s Black Man where the conclusion is also much less important than the glimpses offered along the way of a better way to organise society and of a better way of being human. It's interesting; the UK paperback edition of this novel has your quote - "In fact it is a very good book, perhaps the best Ken MacLeod has written to date." - on the back of it. I've just finished reading this edition and thought it a very bad book. Now reading your review I find myself pretty much in agreement with everything but your final assessment. I don't see how a novel so "defused" and undermined can be considered anything other than a failure. Overall the atmosphere created in this book was fantastic; However I agree there were one or two places where the story goes wrong. The description of what "The Execution Channel" actually is is isolated within the overall story, and there's a hint at an emergent intelligence in the network that isn't taken any further. For a long time I expected a Terminator/Skynet type conclusion. In the end the ending is a massive let down and completely unrelated to the general tone of the rest of the book - its fantastical nature being completely out of keeping with , and a waste of, the general sense of realism and paranoia that he'd spent so long crafting.